I was so caught up in Halloween, I didn't even look at my mileage for October. Actually, I didn't even look at my mileage for November until today. 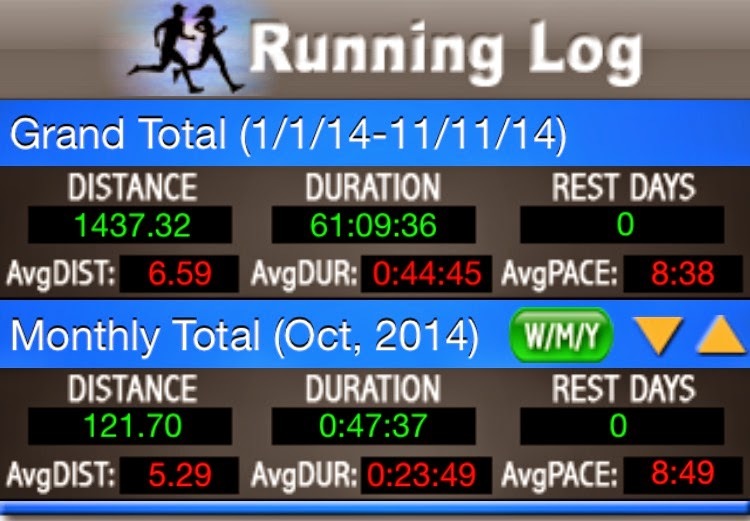 Which lead to a peak at October's mileage and then my yearly mileage. Note: I'm only good at putting in the mileage, not times therefore my pace and duration calculations are not accurate! The rest days part is accurate. Just not the duration and pace. No rest days so far for November. No worries. I will take one, when my body says to do it! Perhaps today, since I have Parent Teacher Conferences tonight. But, while I like conferences as I really enjoy talking to parents, I might need to work out! So I'm keeping it up in the air. 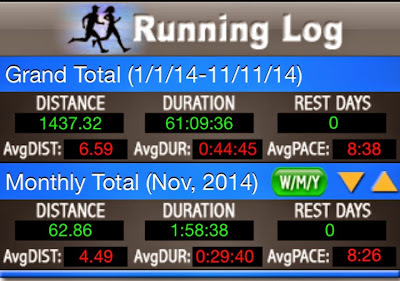 With all of this mileage adding up - look at that 1437.32 miles for the year!!! My feet are sure to get tired and sore. I want to keep them happy, as I've made mistakes in the past before, which led to unhappy feet and no running. I've been trusting my feet to the comfort of OOFOS for the past month. I know where the name comes from...when I put my tired, achy feet in them my entire body says "oooo". They are seriously that comfortable. The technology behind OOFOS goes beyond just saying "oooo". OOFOS is powered by OOfoam and has a unique footbed that hugs your feet, no matter what kind of foot you have. Even my high arches feel hugged in these shoes. They seem to just sink right in and feel all of the comfort, cushion and support my feet crave after a long run, short run, long day working or when I just want to wear comfy shoes. I couldn't wait to get out my shoes, not matter how much I love them. 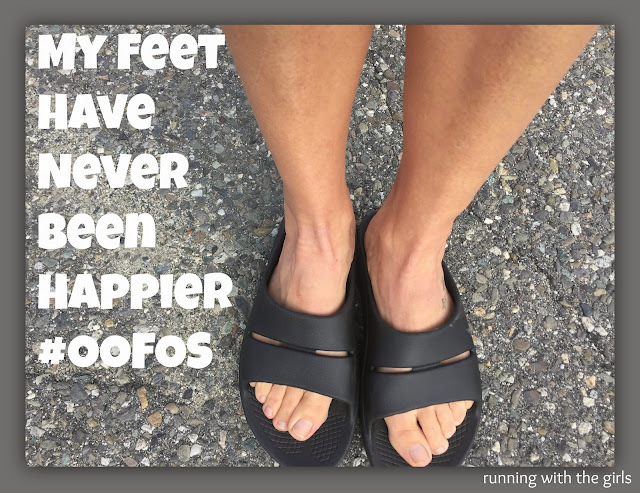 After 13.1 miles, OOFOS felt amazing on my feet! I chose the OOAHH Slide (retails for $39.95) to try out. But OOFOS has two other models available for their customers. the OOcloog Luxe and OOFOS OOriginal , if you prefer a different style. I chose the OOAHH slide because I wanted something I can wear when the weather is warm without socks and when it's colder outside with socks. And if I'm recovering from a long run, the OOFOS will be paired with some compression socks. Do you have a favorite pair of shoes you like to wear after a long run? or a long day at work? If you haven't tried OOFOS, you should! Those look so comfy!!! Especially post-race!